If you find yourself in need of an attorney, there are a number of factors you want to consider: How much experience does this lawyer have? Can I afford his rates? Can I trust him to accurately and passionately represent me? Family law, including divorce, child custody and adoption. Criminal defense, including felony, misdemeanors and traffic offenses. Personal injury, including auto accidents, wrongful death and serious injury. Estate planning, including wills and trusts. Social Security Disability, including application and appeals. At the law firm of Lonnie J. Haralson, IV P.C., I know how emotionally taxing legal disputes can be. Whether I am representing you on a child custody petition, or before the court on a felony charge, I offer superior legal representation with support, compassion and care. Licensed in both Georgia and Alabama, I represent individuals in Troup County and West Central Georgia that is effective and economical. I offer payment plans on a case-by-case basis, am available evening and weekends by appointment, and make off-site visits when necessary. 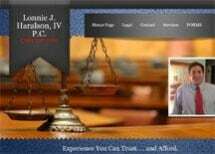 If you are looking for a trustworthy, affordable and effective attorney, contact me. I offer free initial consultations. I serve a wide range of clientele, and every client relationship is valued greatly. Each engagement benefits from the depth and breadth of my expertise. I can provide you with comprehensive legal support allowing us to advocate for you in many areas of law. Review useful forms for your case. View our firm's Facebook page.